The view from the bedroom which overlooked the sea is lovely. The location was brilliant as there were lots of restaurants and supermarkets within easy walking distance. If you needed anything you could ask - I borrowed an iron. 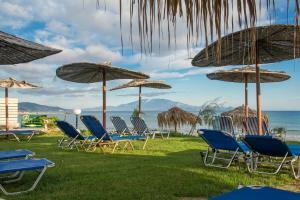 Plenty of sunbeds between the property and the sea which is very near. I liked the fact that Yannis introduced himself and picked me up from the airport. He was always on hand to help. The position is perfect: you really cannot get any closer to the sea than this. An amazing view every morning, and the sound of the sea during the night. The owner is really friendly and helpful. Bed was comfortable. Nearby there are lots of shops and restaurants, plus a mini market managed by the owner. Friendly welcome.Spacious accommodation. Comfortable bed. 2 Balconies one private at rear overlooking river and mountains. One at front but not private. Lovely greek family run business and friendly dogs and cats. The rustic feel of the immediate surroundings. Friendly cats and dogs. Helpful owner/host offering advice and arranging the transfer from and to the airport. Direct access to a nice bit of the sandy beach. Close enough to shops and restaurants without them being a noise nuisance. 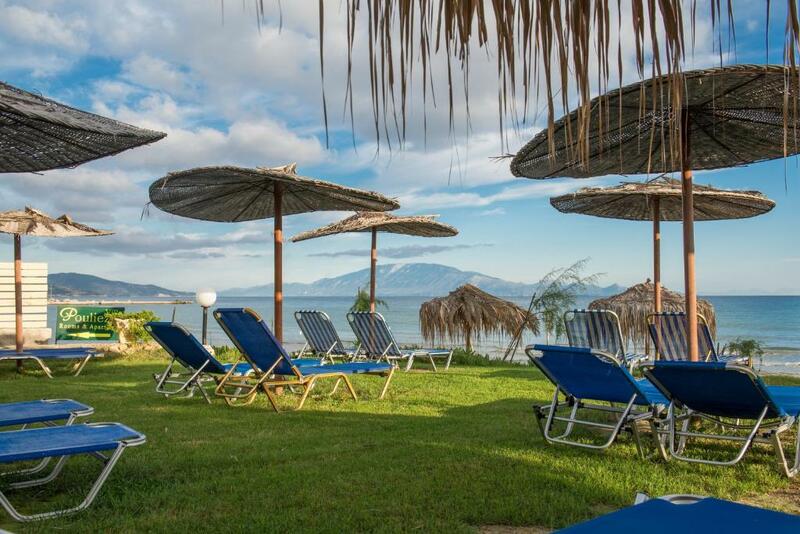 Great location, perfect for exploring Zante. Staff so friendly and helpful. The owner Yannis was super-friendly - always a wave and a smile - really felt welcome from beginning to end. Our apartment had a large balcony which stretched round the building from the front to the back, so you could follow the sun through most of the day. The location was also fabulous - 5 minutes walk to Alykes over the little bridge, or 10 minutes walk to alykanes along the beach, but having it's own quiet spot on the beach with a small beachbar nearby - I have to say it was perfect. 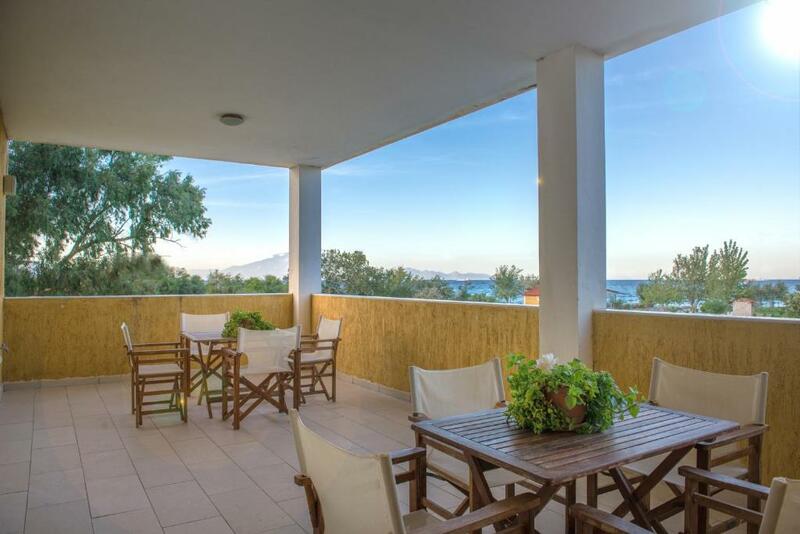 Lock in a great price for Villa Pouliezos Apartments – rated 8.6 by recent guests! One of our best sellers in Alikanas! 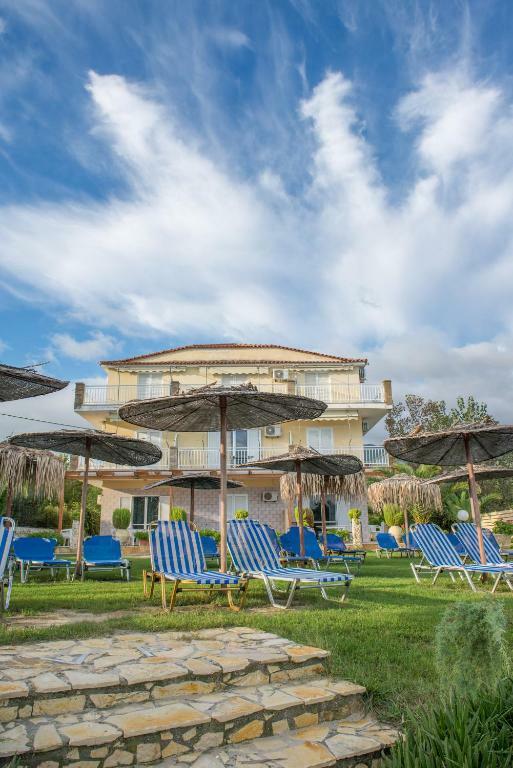 Consisting of 2 buildings, Villa Pouliezos complex is 150 feet from Alykes Village Center and 1,000 feet from Alikanas Village Center. It offers spacious apartments with free WiFi and balconies overlooking the Ionian Sea. Featuring a kitchenette with cooking hobs, refrigerator and kettle, all accommodations offers air conditioning. Each apartment includes a TV and an iron. All units come with a private bathroom with toiletries and hairdryer. Guests can relax in the landscaped gardens or use the communal BBQ. 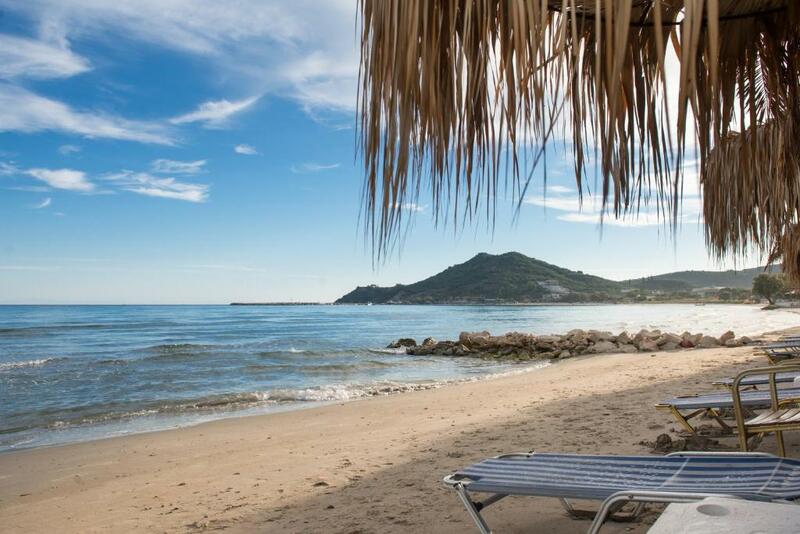 Villa Pouliezos Apartments offers free sun loungers, umbrellas and outdoor showers on the nearby beach. A mini market and restaurants can be found within a 5-minute walk. The famous Shipwreck Beach is located 12 mi away. This property also has one of the top-rated locations in Alikanas! Guests are happier about it compared to other properties in the area. When would you like to stay at Villa Pouliezos Apartments? House Rules Villa Pouliezos Apartments takes special requests – add in the next step! Villa Pouliezos Apartments accepts these cards and reserves the right to temporarily hold an amount prior to arrival. 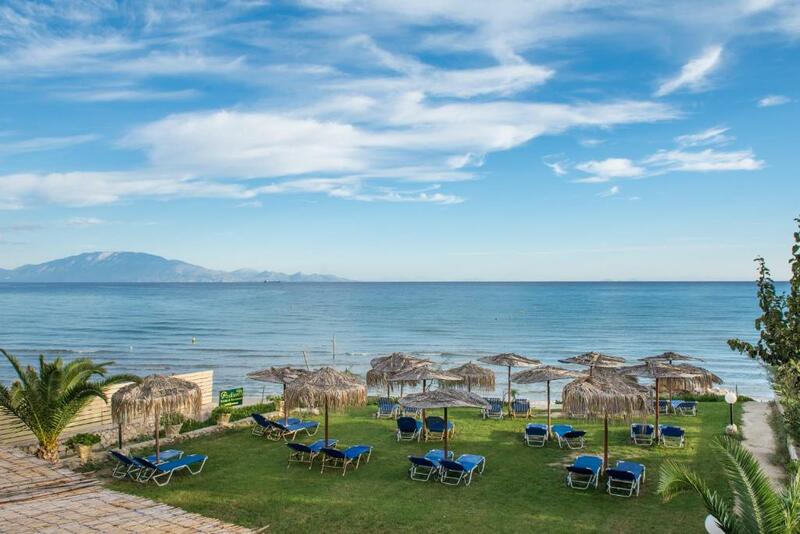 Please note that Villa Pouliezos Apartments consists of 2 buildings, one right on the beach and the second 150 feet away. There is no washing machine in the apartment although you can ask for it to be done for you (I don't know whether there is a charge for this). The bathroom was pretty old and tiny. However, quality/price is very good deal overall. The room are not so clean. The photos shown are not reflecting the room conditions. The cleaning service pass into the room only every 3-4 days. A lot of insects on the floor and flying. We had to run away after 4nights (having paid 7 nights) due to illness of my daughter and no reimbursement (except from a small percentage 10€ a day). I’ve choose to book over Booking.com because of a certain guarantee of the quality and I have to say that this hotel has to be better controlled. Defined Not a good choice. The smell in the bathroom it was annoing due the sanitary fosa. Kitchen equipment, cooker and coffee machine bit old and slow. Walls need to be painted as stained with mosquitos splatters and cement. Exterior of building unfinished and ugly. The shower curtain clinging to my naked body whenever a draught happened to blow through the apartment — not nice. Facilities in the apartment were generally fairly basic, but you wouldn’t really expect much more at the price. To be fair the apartment itself was quite basic - typical greek standard, but it was clean and everything worked - although we didn't need to try the aircon as the temperature was a constant 20 deg without it.